We do this every day but we understand this is a first for a lot of homeowners! We want to let you know what you can expect when we install and maybe even answer some of the “why’s”. We cut out all holes for faucets, small accessories and top mount sinks on site at installation of to ensure the best placement and eliminate breakage (with top mount sinks this is due to the fact that the hole is bigger than an under mount therefore the stone is thinner on the back side of the countertops). All under mount sinks are cut out and polished at our facility. We always install under mount sinks with special clips called Sink-its and seal them to the underside of your countertop with 100% silicone. The plumber will install and connect your faucets and plumbing. We always use 100% silicone on the underside of your countertops to adhere them to your cabinets and along the walls where your backsplash meets the countertops. Should we have anything here about existing backsplash and what they can expect? We typically do not mount the dishwasher to your countertops. All dishwashers can be side mounted into the cabinetry and is up to the contractor, handy man, or homeowner to do so. 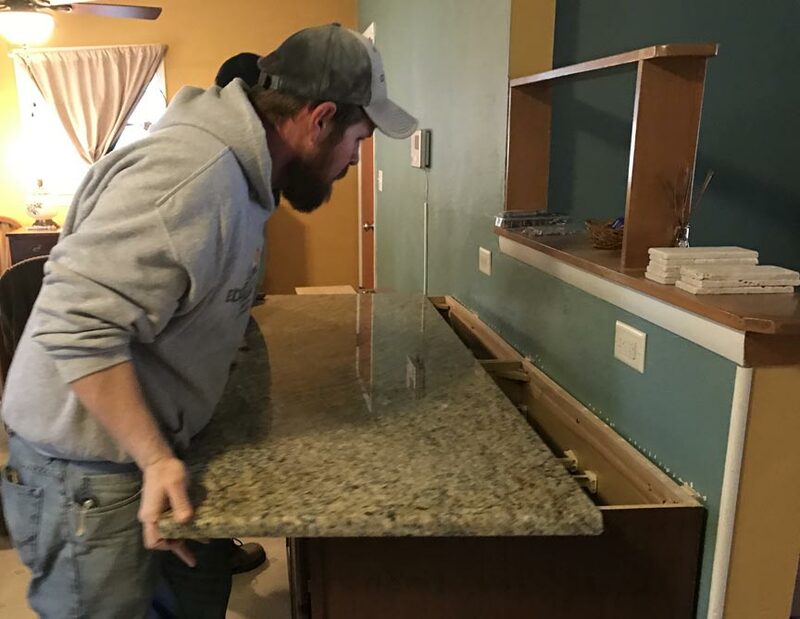 Installing a new countertop is a construction process, and some noise and dust should be expected. After the installation our installers will clean the immediate area and leave the job site in “broom-clean” condition. The countertops will then be sealed by our installers before we leave.